Associate Professor Nuno Martins (ECE/ISR) is the principal investigator of a new National Science Foundation Cyber-Physical Systems Collaborative Research grant, "Designing semi-autonomous networks of miniature robots for inspection of bridges and other large infrastructures." Associate Professor Sarah Bergbreiter (ME/ISR) and Associate Professor Richard La (ECE/ISR) join him as co-PIs. The three-year, $850K grant is part of NSF's National Robotics Initiative. U.S. Department of Transportation figures indicate the country has 605,102 bridges. Approximately 64 percent are more than 30 years old and 11 percent are structurally deficient. Currently, visual inspection is the standard procedure used to identify structural flaws, determine precautionary measures, specify repairs and safeguard the public. Each inspection requires on-site evaluation by experts who spend many hours assessing the integrity of the structure. This new research will create a self-organizing network of small robots that could aid in visually inspecting bridges and other large civilian infrastructure. As they create the network, the researchers will establish new design and performance analysis principles and technologies. The networked robots could remotely and routinely inspect complicated structures, like the assemblage of girders supporting a suspension bridge. The robots will use wireless information exchange to autonomously coordinate and cooperate in the inspection, and whenever possible, they will report back images and key measurements to experts for evaluation. The tiny networked robots will be able to access tight spaces, operate under various weather conditions, and autonomously execute tasks for long periods of time. Because experts can remotely supervise the robot network, both cost and the time between the on-site inspections they need to make will be reduced. At the same time, the flexible system will increase the regularity of inspections, improving the detection and diagnosis of problems. The goal is to increase safety and support effective preventive maintenance. The researchers are collaborating with Resensys, a company that specializes in remote bridge monitoring. Resensys is a portfolio company of the Maryland Technology Enterprise Institute's (Mtech) Technology Advancement Program, an Mtech VentureAccelerator graduate and a former UMD $75K Business Plan Competition winner. Resensys’ President and CTO Mehdi Kalantari (EE Ph.D. 2005) is an assistant research scientist in the Electrical and Computer Engineering Department. 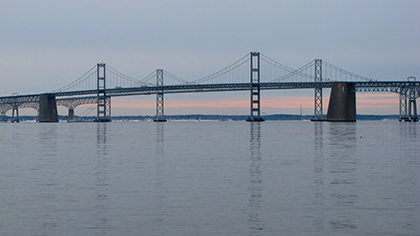 The system will be tested in collaboration with the Maryland State Highway Administration, which will provide feedback and expertise throughout the project.